Three AM. found us on the road, again, not crane this time Antelope was the quarry this trip. We did a few scouting trips three in fact the area we got tags for is HUGE. We had a destination in mind and were going to be the first there, we were but barely. We hiked two miles out to a concealed pond in a large coulee. Settled in to wait. I was a little over dressed the forecast was for 42* and on and off rain all day. It turned out 50's clear and NO WIND. Shooting time came then sun up, no antelope to be seen, Dang. About 30 minutes after sun up The D-I-L sings out antelope on the horizon, yup 3 does and a buck. We made a plan and started to sneak on the band .We got stuck on a small knoll and could get no closer. Made a range reading , 428 ish to the buck. We watched for a few and decided this was it or not. The D-I-L had the choice she spotted them first , she said " I got this" She was packing her 25/06 she calls black Mamba . I short time she sent the bullet down range. 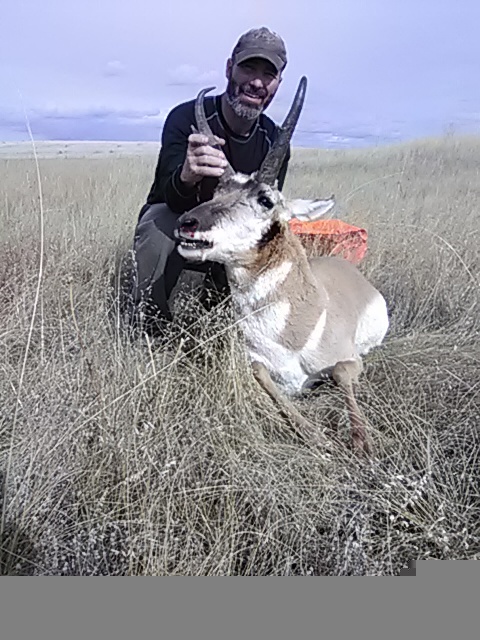 I had the 6 on t as back up , the antelope jumped straight u 4 feet then ran a semi circle dumping out his life juices 20 yards and it ran out, first one down. 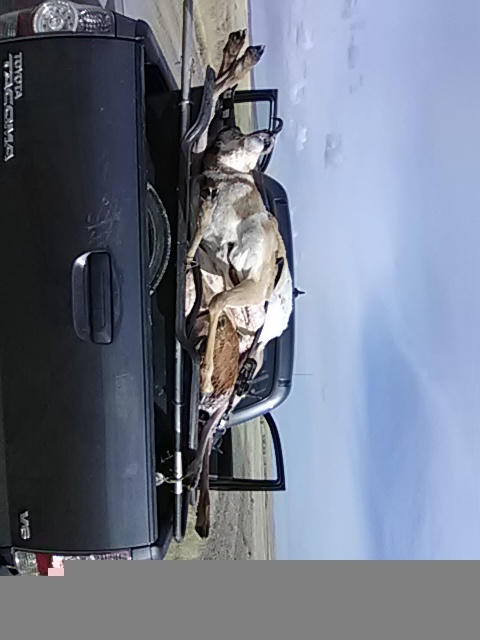 A quick clean out and a scan and we spotted another small group of doe antelope. Off we go this time it was close to a half mile we got stopped on a two track road the does slammed on the brakes and looked right at us. The buck that was in tow however could care less that three hunter orange vests where glowing in the sun. Range finder out, it said 450 to the buck sniffing around. It was my call this time, I had the 6 and was comfortable with long shots. 80 gr TTS 8108 powder at 3600 fps did it's part and the buck collapsed in it's tracks. I was kinda surprised that a very slight breeze moved my bullet 4" but the bullet crushed the front shoulder ,heart and other shoulder so all was good. As it turned out My scope mount broke at some point after the shot , till I was getting ready to put the gun away, No idea yet what the cause was. The boy trotted back the three miles to get the cart. D-I-L and I went back to the first kill to gather up our gear and drug the first to the top of the hill. The Boy was there so fast I could not believe it. We were on state lands and there was a few two tracks and shot grass very easy retrieval. We did run across a truck out driving the ridges of the parcel which is a Big No-No. We got the plat # and called Tip Mont and turned it in. By time we had the cart in the truck and cleaned up a FWP truck stops and inquired if we did the call, we said yes and told where the truck was and he sped off, COOL. Now back to work we need one more. Getting 3 in a day is a trick in it's self, but it was only noon. We checked a few spots with little action , but a Buck Just appeared on the road in front of us, what? It trotted on to a peace of state land to our right, there was a place to park and no fence. This just can't be happening. It disappeared just over a rise and the boy was on it. Belly crawling through the wheat stubble in full sight of the road. AND the FWP truck that just stopped beside us. What a GREAT officer he was almost silent as he walked to the window of the truck. He said he would just look at one of the tags on the bucks in the back, very quietly he did and was back at the window when the boy shot. He then spoke up and said' WOW that sounded like a kill shot, it was. He was a different officer and mainly stopped to tell us they got the truck driving on state. WELL we had a different plate number form a different truck on a different parcel and gave him that one two, off he went to go look. A fast 1/2 mile drag and we had 3 in the truck. The boy was using his 6.5 Creedmoor and a 289 yard shot is child's play. What a trip !!!!! The BEST FWP encounter we have EVER had too. 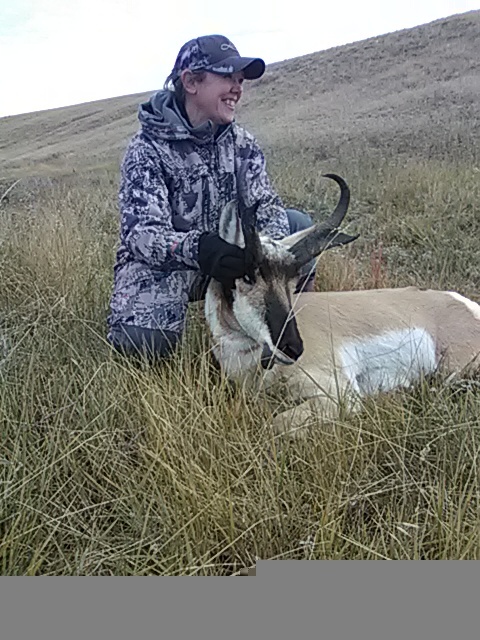 When I got home and took the 6mm out of the case after the Antelope hunt , my scope almost fell off in my hands??? WOW less then 10 days to deer/elk season. I did some scrambling in our "Parts box " And found a fix. As you remember the scope base holes are drilled way off center of the bore. I am using windage rings and some caritive base mounts to make it shoot right. What I found was some Burris mounts with inserts for windage .30 I do believe, Anyway got it on and had to wait for some dry weather. Got a brake , well the mud dried up a little. The wind is about 30mph now and was around 20 when I went out this morning. All said I was close. I put a target out at 100 yards , it would blow away if I went any farther out. I was sitting on my coyote belt pad with the Bipods on leaned up against a fence post with my elbow propped up with my knee. Fairly steady for the wind. The wind was almost in to my face but a little to the left cross, as good as I could hope for in a hurricane. 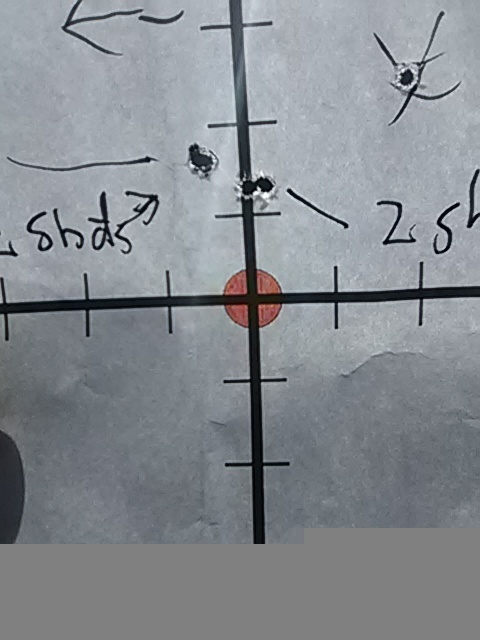 I was JUST off the paper to the left and 5" high with the first two shots. A total of 6 shots had me almost where I wanted to be. 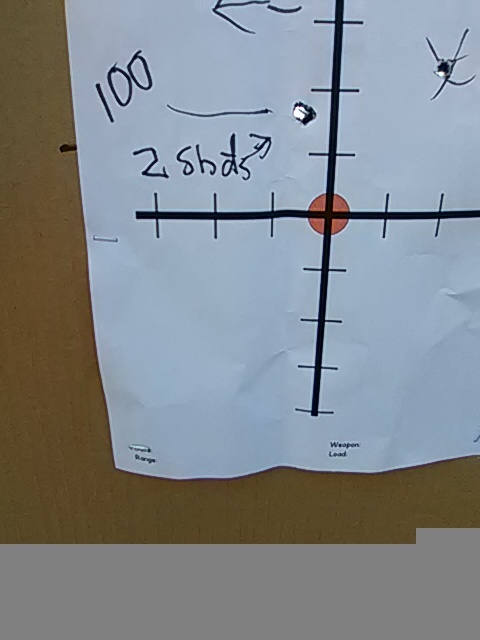 With not being able to get paper out at 200 yards I was "shooting" for an inch and one half high at 100, with my 80 gr 6mm tts Barnes at 3600 fps, That should put me someplace from dead on to 1/2 high at 200 yards. One last adjustment and I was there. I put two side by side and called it good , till I can get it on 200 and 400 yards, but if I can't before deer season I think I'll be OK .?.?. ?